From William Carey to the present day, agriculture has been important work for BMS. Amongst Carey’s luggage when he travelled to India in 1793 were 108 botanical magazines. But this interest in botany and agriculture was not just a hobby for himself – he wanted it to work for the good of India. Up to that time, very little had been done to clear the jungles, drain the marshes, irrigate dry land, cultivate new vegetables and improve tools and transport. In 1820 Carey formed the Agri-Horticultural Society, which would develop the resources of the country. The society still exists today, promoting agricultural development in India. However, it wasn’t until 1947 that BMS seriously began to think about sending agricultural missionaries overseas. 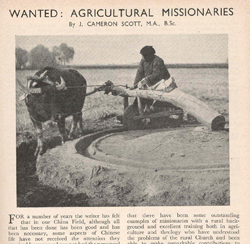 Just after the war J Cameron Scott, who worked in China, wrote an article in Missionary Herald entitled ‘Wanted: Agricultural Missionaries’. He was concerned that while most agreed that ‘the gospel of Jesus is for the whole person and for the whole of life’ mission work was not being as effective as it could be: ‘nine-tenths of the members of the Christian churches overseas are people in rural districts, while the majority of missionaries are trained in towns and have had their early upbringing among urban surroundings’. He challenged agriculturalists to contact BMS and use their skills overseas. Not long after, Scott found himself in correspondence with David Stockley, a young agriculturalist. In 1950 David applied to BMS and, soon after, he and his fiancée Joyce, sailed to East Pakistan (now Bangladesh) to begin work as pioneers in agricultural mission. Their first placement was in Khulna where David developed nine acres of land and taught students how to plant new crops and use new methods – those students later became pioneers of agricultural innovation in many different parts of East Pakistan. In 1965, the Stockleys were transferred to Chandraghona, to develop the farmland attached to the Leprosy Hospital and promote more productive farming methods in the district as a whole. David was soon in demand as a consultant to church and government agricultural projects throughout East Pakistan. During the 1970s he promoted irrigation schemes and modern methods of rice cultivation amongst co-operatives in the Rangunia area. 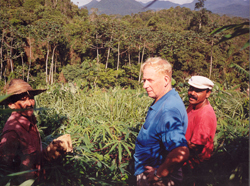 He was awarded an OBE in 1976 ‘for outstanding service to agricultural development in Bangladesh’. In 1985 David and Joyce moved again – this time to Brazil, to work with the CEBADER project (the Baptist Centre for Rural Development). David Stockley was also instrumental in the founding of Operation Agri. Seeing the agricultural needs of the farmers in Khulna during his early years in East Pakistan, he began to write to BMS asking for tools, seeds, day-old chicks, and other farming aids. In 1961 the Baptist Men’s Movement offered to take on the task of raising funds and sending out the goods for the work of the agricultural missionaries as the work expanded. In the 1960s BMS had four missionaries engaged primarily in agricultural work in East Pakistan, India, Angola and Congo. Nowadays Operation Agri supports rural and urban development projects on three continents. While it is no longer possible to send seeds or chicks, during 2006/07 just under £280,000 was sent in development project grants. Many of the projects are run by churches or organisations in partnership with BMS. Today, the work continues. There are still a handful of BMS people working with partner organisations in agricultural contexts in Brazil, Congo and Nepal. Many more are involved in the linked, but wider, activity of poverty reduction. Among other examples, BMS is helping to improve learning opportunities for women in Afghanistan and for children in Angola, to develop livelihood skills in Indonesia and North Africa, to address injustice in Uganda, to re-skill people living with HIV/Aids in Congo and to improve life with dignity for many urban dwellers in the poorest parts of the world.